The 30th Calibre Design Awards Winners were announced at the Gala Event on Friday, May 18th at the Beverly Hilton Hotel. Click here to see all the 2018 nominated projects including all the winners. Lam & Kaainoni Engineering Corp.
AJ Amoroso Construction Co., Inc.
Calibre Celebrates the Winners of the Student Awards Programs! This year’s IIDA Southern California Student Awards Program included a Portfolio Competition and a Student Design Charette. 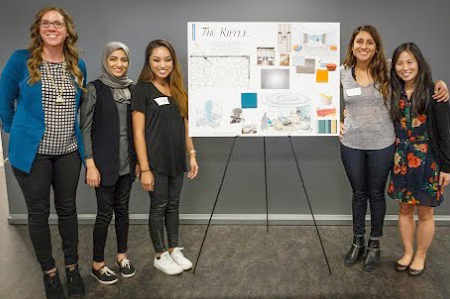 Thirty students from Interior Design Programs throughout Southern California were selected to compete in this prestigious design challenge. The students were grouped into teams of five and challenged to design a flexible retail concept including a specialty market, bistro restaurant and cooking classroom. The project was located in the heart of historical Downtown Los Angeles in the Broadway Trade Building. Teams had 4.5 hours to collaborate and come up with creative design solutions using only hand drawing and rendering, after which, they presented to a distinguished panel of judges comprised of local Interior Design and Construction industry professionals. The winning team will be awarded $10,000 at the Calibre Design Awards. This team went on to represent IIDA SoCal and compete in the Western Region Student Design Charette held in Phoenix, AZ. Twenty student members participated in this interview-style event in two categories – Social Relevance and Innovation. Additionally, the Stephanie Tarr Memorial Award was given to a student for outstanding community service and student leadership in IIDA. Each student earned a $5,000 scholarship prize. Winners include Rae Chye (Art Center College of Design) – Innovation Category, SuSun Kwak (Art Center College of Design) – Social Relevance Category, and Angela Hickman (California State University Long Beach) – Stephanie Tarr Award. Congratulations to all the student winners! Click here to see the 2017 nominated projects and teams. See you at the Beverly Hilton! We are proud to be able to host IIDA’s Calibre Design Awards 2017 at this prestigious venue. Be sure to buy your tickets early, as a full sell-out is expected! Opened in 1955 and was designed by architect Welton Beckett (his other projects include Capitol Records, The Music Center, and LA Memorial Sports Arena). The first luxury hotel to have never-before seen technology such as high-speed elevators and air-conditioning thermostats in each room. Hosted the first Grammy Awards in 1959. Home to the Golden Globes, Daytime Emmy Awards and the Oscar nominees luncheon. Watch out for the paparazzi! Come one, come all. Get your tickets! Click for more information about ticket sales! Sponsorships and tickets are still available! There are several levels of sponsorship opportunities for the Calibre Design Awards. Click here to download the full sponsorship package. Among other benefits, event sponsors get an ad in the printed program – so sign up today! The 2017 Calibre Design Awards nominees to be released soon! Tickets and Sponsorships are Available Now for the 2017 Calibre Design Awards! As Principal of Shimoda Design Group, Mr. Shimoda founded a Studio based on a multi-disciplined platform that seeks to bring quality design, innovation and technical excellence in projects of every scale. Contract magazine named Mr. Shimoda Designer of the Year in 2013 and in the following year was elevated to the College of Fellows for the American Institute of Architects. In 2015, Mr. Shimoda was elevated to the College of Fellows for the International Interior Design Association. He joins less than 20 Designers in the United States that share the distinction of Fellow as both an architect and interior designer. Joey will join a prestigious group of past Circle Of Excellence winners including Carl Magnussen (2010), Ed Friedrichs (2011), Ray Anderson, (2012), Lauren Rottet (2013), Pam Light (2014), and Barbara Dunn (2016) amongst others. Sponsorships and Tickets are now available! Click here for more information about the Calibre Design Awards, to sponsor the event or to purchase tickets. Congratulations to the 2016 Calibre Design Award Winners! Congratulations to the 2016 Calibre Design Awards winners! Click here to see more photos of the winning projects. Thanks again to our generous sponsors, we couldn’t do it without you! See the all photos from the Calibre Design Awards here. Nominated by HKS Architects, Inc.
Join Us for the Calibre After-Party! Announcing the first Calibre Design Awards After-Party! It will be held right after the Awards ceremony at the Beverly Hilton. Open to Calibre ticket-holders only. You asked for more networking time and we listened! Stay tuned for information about other changes in the coming weeks. Limited availability for Gala tickets – to be added to the wait list, please contact Amy Staszkow at Blue Room Events at 310-491-1401 or amys@blueroomevents.com. Congratulations to all the nominated teams! See the list of 2016 nominated projects. Every year at the Calibre Design Awards, IIDA celebrates not only the best teams in design, but some of the up and coming talented students soon joining the local workforce! The IIDA Southern California Student Design Charette is an opportunity for IIDA student members enrolled in a Southern California Interior Design college program to participate in a charette challenge. All Southern California schools are invited to participate on a first-come, first-served basis, sending three students to the all-day event. 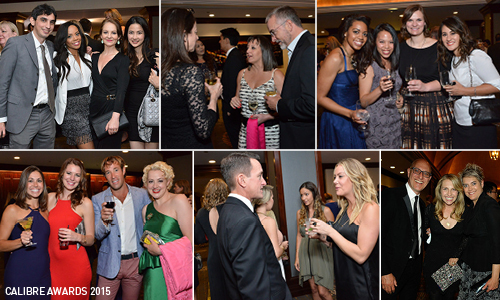 This year’s event was held on November 14th, 2015 at LPA in Irvine. Teams gained collaboration and teamwork experience, while challenged to develop a design presentation based on a program assigned at the beginning of the day. A panel of judges from the local design community viewed and selected the top presentations to move onto a verbal presentation round. The first place prize of $10,000 will be divided among the winning team of students which included, (from left to right) Ashley Achleithner (Art Institute of CA, San Diego), Ghadeer Alburaiki (Otis College of Art & Design), Jackiemae Apolinario (Mt. San Antonio College), Rina Velasco (Cal State University Northridge) and Christine Oiwake (Cal State University Long Beach). Congratulations to these IIDA Student winners! The winning team of students will receive their check at the Calibre Design Awards Gala on May 13, 2016 and will be representing the IIDA Southern California Chapter at the next round, West Coast Design Student Charrette, which will be held in Seattle, Washington in April. Tables are selling out as the event is fast approaching. Only 2 months away! Very limited General Seating left, secure your seats now! Click here to purchase tickets and become a sponsor. Calibre has a new home! We’re moving to the Beverly Hilton! The Beverly Hilton is a star studded venue, having hosted the Golden Globes since 1961 among numerous other Hollywood glamorous events. Not only does the Beverly Hilton host Clive Davis’ Pre-Grammy Parties, but also high profile political events like Richard Nixon’s final press conference. We are proud to be able to host IIDA’s NEW Calibre Design Awards 2016 at this prestigious venue. Be sure to buy your tickets early, as a full sell-out is expected soon! Check out this You Tube video about the history of this historic hotel. Click here to purchase tickets and become a sponsor.